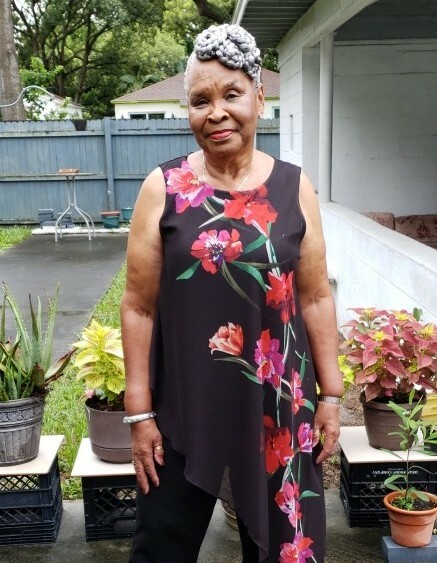 A homegoing celebration for Mrs. Shirley Ann Roper Jackson of Tampa, Florida who passed away on Friday, January 25, 2019 will be held Saturday, February 9th, 2:00 p.m. at Aikens Funeral Home, 2708 E. Dr. Martin Luther King Jr. Blvd., Rev. Michael Neely, officiating. The interment will be in Rest Haven Memorial Park Cemetery. Shirley was born May 6, 1943 in Apopka, Florida to the late Doc and Era Roper. She enjoyed cooking, dancing, sports, and watching her favorite TV shows. She was preceded in death by her parents. She leaves to cherish her precious memories with her sons, Derrick L. Johnson, Antonio L. Johnson and Curtis D. Johnson; grandchildren, Shirley S. Johnson, Quinton L. Johnson and Jamal A. Johnson; great-grandchildren, Destinee White; step-mother, Naomi Fernandez; brothers, L.C. Roper, Anthony Roper and Risedell Roper; step-brother, Charles Jones; sisters-in-law, Marie Roper and Beverlyn Roper; cousins, Jessie Henderson (Cherrie), Wallace Henderson and Laura Tolbert; friends, Wanda Camacho, Raul Mustafo, Leanne Foxworth, Gene Johnson, Mollie Lodin, Patricia Jones, Robert Walker, Dera Cotton, Edna Stanley and Shirley Reese; a host of other relatives and friends that will miss her. The visitation will be held at Aikens Funeral Home on Friday, February 9th from 5:00 to 7:00 p.m. The family and friends will receive friends from 5:00 to 6:00 p.m. The family and friends are asked to meet at the church on Saturday for the service.